Home plate is seen after the last regular season game at Yankee Stadium on Sept. 21, 2008, in the Bronx. With the help of a few legendary players and Bronx teenagers, the New York Yankees carried pails of dirt from their home plate and pitchers' mound from their old home to a new one Saturday. Under a steady rain, 15-year-old Gabriel Nieves shoveled about five pounds of dirt from Yankee Stadium's home plate into a blue and white pail, while his mother, Audrey, watched with tears streaming down her face. "This is just awesome," Audrey Nieves said. "This is a big deal. This is the end of an era." Nieves joined Yankee legends David Cone, Paul O'Neill, Scott Brosius and Jeff Nelson to move pieces of history from the original ballpark to the new one being built across 161st Street. 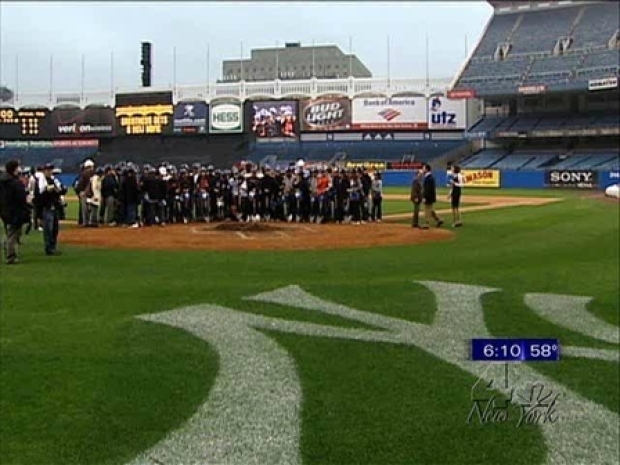 Nieves, one of dozens of Bronx High School students in a Yankees-affiliated engineering and architecture program, walked the dirt from one mound to another, while construction workers carried the home plate and pitcher's rubber coverings. With the help of a few legendary players and Bronx teenagers, the New York Yankees carried pails of dirt from their home plate and pitchers' mound from their old home to a new one. Cone, a 1998 World Series champion who pitched a perfect game from the pitchers' mound a year later, stared Saturday at the hole in the ground after a worker pulled up the rubber covering. "This piece of rubber is special, because this is how we made our living, on this piece of rubber," said Cone, 45. He said he was also attached to the original bleachers. "That's where the `Bleacher Creatures' would yell our names, and the bleachers shook during games," he said. The played their final game Sept. 21 at the 85-year-old stadium, a 7-3 triumph over the Baltimore Orioles. The new, $1.3 billion stadium is set to open next April. At the new stadium, the 15-year-old Nieves helped set the new home plate down, and dreamed about the future. "This is a once in a lifetime experience. It's something you remember forever," he said. "And maybe I'll help build the next Yankee Stadium."